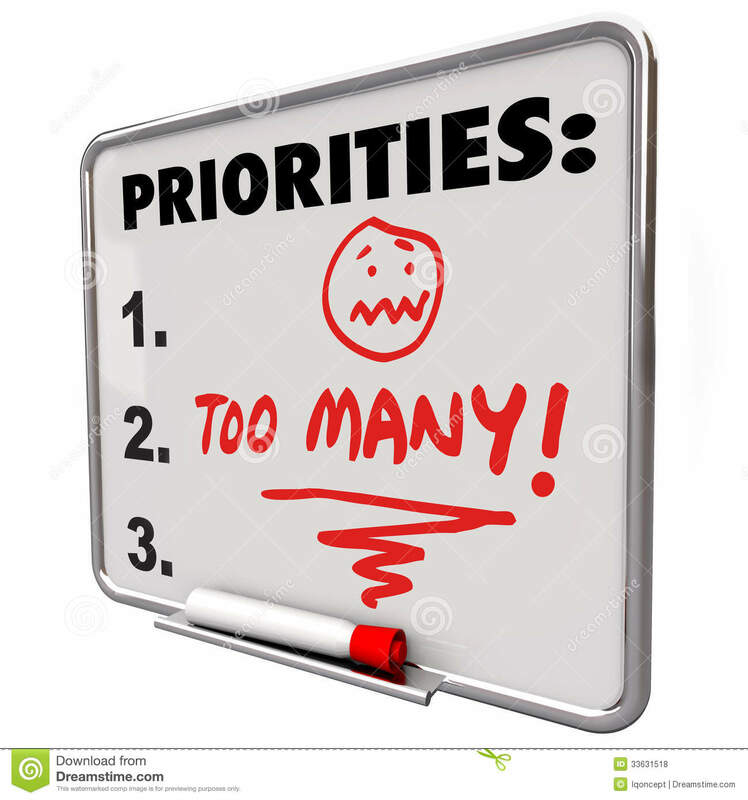 Priorities: According to the dictionary this means “a thing that is regarded as more important than another” or “the right to take precedence or to proceed before others.” I’d like to talk about this. Today is a tough one. One kid just got braces and he’s been miserable for days. The other has a martial arts tournament today. This tournament is about 30 minutes away and I would be sitting most likely in a gym for 6 hours to watch one minute of performing. The fact is, I wanted to go to the tournament to support her and she wanted me to watch her, but the one miserable at home wanted me to stay with him. If I choose one kid over the other, the other child is most definitely going to feel slighted. One will feel that I don’t value them enough to take the time to watch them, and the other is upset because mommy is not there to make them feel better. So, what do you do? After much grappling, I chose to stay with the kid that wasn’t feeling well and now I’m in the dog house with the other. Her dad went instead and she’s annoyed with me. I feel like I can never win. I truly believe illness trumps all. My son needs comfort today, meds given on time so he feels better, soft foods. Priority made, but I’m still upset that I can’t be in two places at once. It’s like that with my writing life, too. What are my priorities? Building my Social Media platform? Tweeting, Facebooking, Google+ing, Blogging regularly? Finding an agent? Querying contests? Learning how to do a mailing list? Making a treatment for Hollywood? Advertising? Book Store appearances? Creating give-a-ways? Creating Pinterest boards for your books? Signing up for a Conference? Querying media? Getting reviews? Do you see a problem with anything in this list above? Where is “writing?” It’s not even there because as indies we are required to do everything else to gain any modem of success. I can’t tell you how many writers feel like there is so much to do, that writing has not become the main priority any longer. And they’re pained by it. They miss it, but they’re trying so hard to be successful, there are simply not enough hours in the day to get it all done. So I go back to the definition of priorities above and realize that what is most important in my writing life has to be the writing. I find I get mired in all the rest of the conversation and marketing minutia and have to step back to basics or I’ll never get projects out. In life, in lieu of time, hard choices are going to have to be made. Decisions are going to have to be brought down to basic needs. For family it will be “which kid needs me most at this time” and in writing it has to be “getting the words down on paper.” No matter what I do, someone is going to be unhappy and some project is going to get put on the back burner. Both are important, but I have to make a decision. In these cases, it simply means that “for that moment in time” I had to make the priority to get what had to be done first. Tonight I’ll take kid #2, who is unhappy I didn’t go to her tournament, out to dinner alone to celebrate, and maybe later today I’ll work on social media, but for now, I’m with my sick kid and after this blog, as my son is on the computer, I’ll work on Book #3 in my Kelsey Porter Series. It’s all about priorities and nothing about them is ever easy. Love to hear your thoughts on this. I’ve been disturbed recently reading reviews on the internet across a myriad of topics. The three biggest offenders for me are reviews on books, reviews on over the counter products and reviews on recipes. These reviews are put up on the web where the anonymity of the internet allows consumers to post how they feel about a product, whether or not that person is even credible. Many times they are not. One Star Book Reviews: Most of the time if you see someone post a one star review they are either a troll (a person out to simply be vindictive to that author, or they just want to make a nasty statement to hurt someone). Why do I say this? Because if you READ the review, you’ll realize the reader many times NEVER even read the book, didn’t go more than two pages, reviews another book and mixed them up, or is upset that they thought they bought a romance and got a thriller. I kid you not. I’ve seen people give one star reviews because they bought a book in the wrong genre and are blaming the author. I saw another person give a book a one star review because they bought Book #5 or #6 in an epic series and were upset they didn’t know the history of the series because they never purchased the other previous novels. Now, I’m not saying people aren’t entitled to say they hated a book, but make sure the review is solid. Is it poorly written? Filled with grammatical errors? Did they not like the plot or heroine? If there is a solid reason for that one star, okay, if not move on. One Star on OTC (over the counter products like aspirin, laxatives, allergy meds, etc): I saw this yesterday all over amazon. People giving reviews for medications. The big thing I noticed is that most people claiming one star reviews over-medicated themselves each and every time and were trashing the products for the side effects. One medication said take 1-3 pills with lots of water. (and to START with one) These people went right ahead and claimed they took three pills and were upset they got very bad side effects like their insides were about to explode. Even when the packaging said that you should start with one, but you CAN take up to three if your symptoms keep persisting. I saw one star after one star review, all of these people took too much medication and then blamed the product. Others already have problems where they shouldn’t even take this product in the first place, others didn’t drink enough water, milk, food, with the medications and blamed the product. It’s odd to me that people will feel this need to post in this fashion. Where is their own responsibility in this? People must be participatory in their own healthcare issues. Be smart. One star recipe reviews. I’m a cook, so I read reviews on recipes all the time. I know enough about cooking to be able to look at a recipe and adjust it if I need to, but when I see a one star review for something and the person didn’t have half of the ingredients in the recipe and instead substituted and THEN writes a one star review that says “this wasn’t tasty at all,” well, I have zero sympathy. I didn’t have sugar, so I used X, and I didn’t have nuts, so I used X and I didn’t have wine so I used X. How in the world can you write a bad review of a recipe if you didn’t use the ingredients listed or follow the directions? The meat was tough, but I didn’t have enough time to cook it for the instructed 5-6 hours, so I just upped the temperature on the stove. I wouldn’t recommend it to anyone. I know the recipe called for fennel, but it was too fennel-y for me. And I also don’t like fennel in the first place. The thing is, think before you review something. People look at reviews, but we are starting to be smart enough to realize some of our reviewers are not credible. If you haven’t even purchased or read more than a page of a book, and slam it, well, you have no credibility. If you slam a product because you didn’t take the correct dosing and overmedicated yourself and now have side effects, that’s your problem. If you do a recipe and substitute ingredients and are upset with the end result, that is again your problem. I think people just don’t like to follow directions. They want to beat to their own drum and get upset when things don’t go their way. Accountability folks.